Beyond bikes, great for locking your closet doors shut too! Our Combination Cable Bike Lock - Master Lock is a dorm necessity if you plan on bringing your bike from home to your college campus. You'll want to keep your bike safe, so this is a campus security necessity for any bike owner since you'll have to leave it outside. 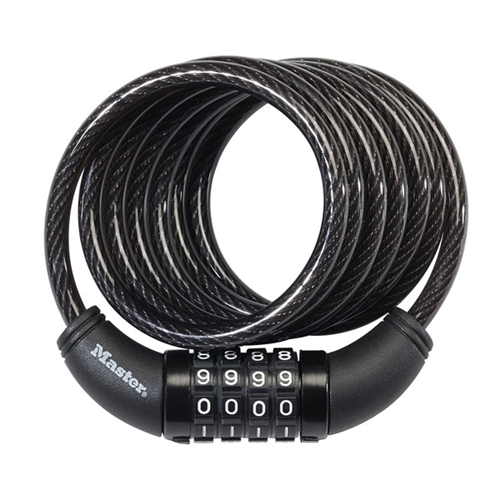 This is a 6 foot long self coiling cable, and you are able to set your own combination lock with it that you'll be sure to remember. To be sure that your bike is kept in tact, this quality dorm supply has a vinyl coating to protect the finish on your bike. 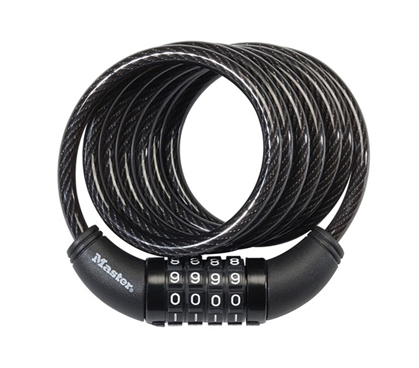 Our Combination Cable Bike Lock - Master Lock is 8MM thick, making it a strong cable that will be sure to protect your bike. Even if you don't have a bike on your college campus, you may find another need for this dorm essential. You can easily lock your closet doors shut or secure your dorm trunk with our Combination Cable Bike Lock. That way, if your roommate is less-than-trustworthy, or just forgets to lock the door all the time, you won't be in fear of your stuff being stolen every time you leave your dorm room.